TACKLE YOUR TUESDAYS WITH US! Do you want to assist with restoration throughout our preserves? please email for specific location and meet up details as we are always moving around. Join our restoration ecologists at a community volunteer opportunity and learn more about restoration techniques while making a real difference. Volunteers of all ages are welcome to participate by removing invasive species, cutting, hauling, and/or burning brush. Restoration days are held from 9:00 a.m. until noon unless otherwise noted. Please wear appropriate clothing and footwear. 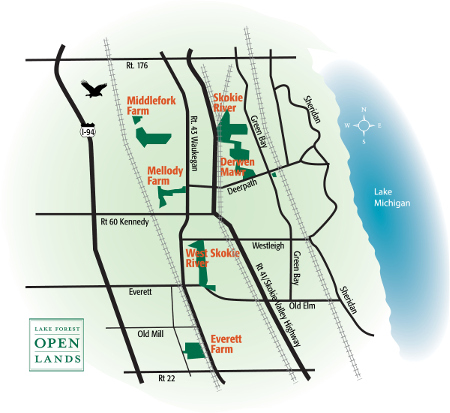 Lake Forest Open Lands will supply work gloves and any tools needed during the work day. For more information about restoration work opportunities please contact our Volunteer Coordinator. Assist our staff in volunteer restoration activities such as burn prep and invasive species control. Access and parking are located on James Court, east off of Telegraph Road (approximately 1/2 mile north of Route 22). Park in the small lot on the north side of James Court and walk east to the trailhead and kiosk. For large group registration and more information please contact our Volunteer Coordinator. Spring volunteer work day activities include brush control and planting. Access to the Skokie River Nature Preserve is at the west end of Laurel Avenue, west of Green Bay Road. Park at the end of Laurel and walk on the bike path across the bridge to the wood-chipped trail on the right. Chicago River Day aims to control invasive species such as garlic mustard, and plant native species such as trillium. Access to the Skokie River Nature Preserve is at the west end of Laurel Avenue, west of Green Bay Road. Park and meet the staff in the parking lot at the end of West Laurel Avenue. Our Annual Garlic Mustard Pull helps control this invasive species. The most effective treatment is hand pulling by getting the root. Garlic mustard seeds stay viable in the soil for upwards of 7 years, so it's important to catch it before it goes to seed. Join our restoration team at Derwen Mawr Nature Preserve for a morning of land management activities including invasive species control, planting and reseeding.